That title is wrong, to be honest. 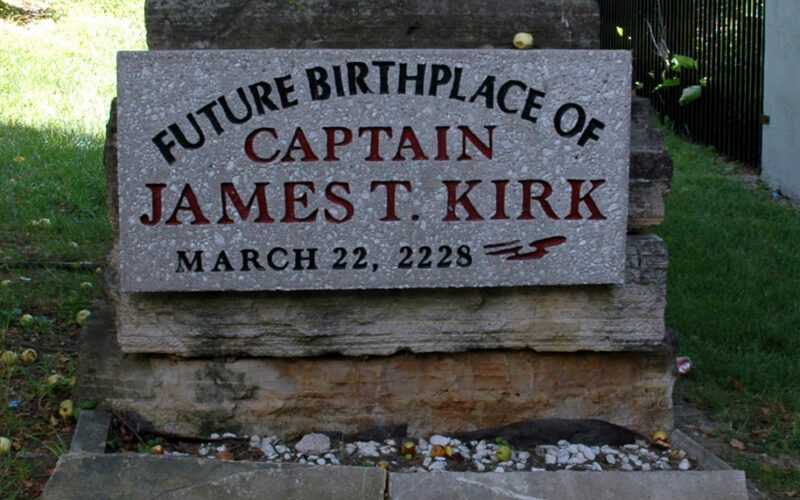 Riverside, Iowa isn’t the birthplace of Captain James T. Kirk. It’s the future birthplace of Captain James T. Kirk – as you can see on the photograph of the plaque. It seems that in 1985, the city was considering what theme they should have for the local festival. One of the members of the council remembered that in at least two of the Star Trek novels, Riverside, Iowa, was mentioned as the birthplace of James T. Kirk and the city in which he was brought up. A pretty cool marketing idea for the city was born. Riverside now houses The Voyage Home Riverside History Center, otherwise nown as the Star Trek Museum. By the way, you get bonus points for knowing what the T stands for. Captain Kirk’s full name is James Tiberius Kirk.